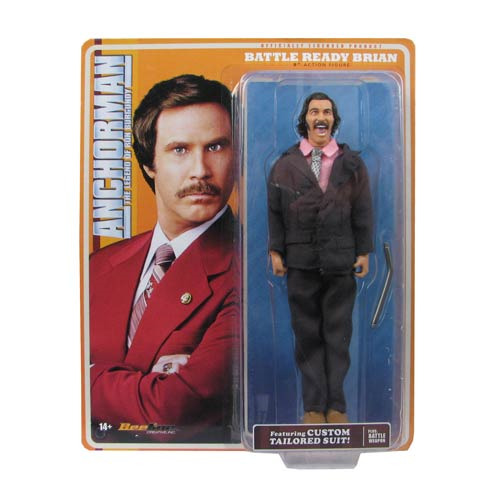 Shopping for Anchorman Action Figures? Channel 4 News Team member Brian Fantana is ready for street brawling action with the MEGO style Anchorman Battle Ready Brian Fantana 8-Inch Action Figure! The figure is an awesome likeness to actor Paul Rudd, who plays the stylish and arrogant field reporter in the movie Anchorman: The Legend of Ron Burgundy. Whether it's a back alley beatdown or a tussle in the parking lot, Fantana's ready for anything with his included pipe weapon! Ages 14 and up.